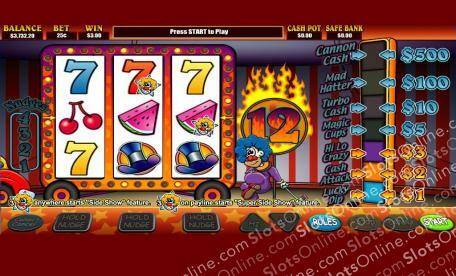 The Super Sideshow slots are the best choice for players who love bonus games above all else. Click here to play! You haven't really played bonus slots until you have tried the Super Sideshow fruit machine. With 9 bonus games, both major and minor, as well as nudges and holds, you'll be surprised at how little time you spend on the reels! Join Ricky the Clown in the Super Sideshow slots, and try to match multi-colored 7s, red cherries, watermelon slices, and top hats in between all the great bonuses you’ll be playing. In 25c, 50c, and $1 versions, this fun bonus filled game suits a range of different price levels. The first of the bonuses in the Super Sideshow slots is the Sideshow bonus. This is triggered when 3 Clown symbols appear anywhere on different paylines. In this, the player is moved around the feature board and bonuses are paid into the Cash Pot or removed from the pot depending on the square landed on. If 3 Clown symbols land on the same payline, the Super Sideshow bonus is triggered, which is like the Sideshow bonus, but with better prize opportunities. To protect the money in your Cash Pot, you will need to collect it before it is lost or decreased by certain feature board squares. The Cash Ladder is another of the bonuses in the Super Sideshow slots. Every time a winning combination is completed in normal play, it will be added to the Cash Ladder. To climb the ladder, the player must correctly guess whether the next Ring of Fire number will be higher or lower than the current one. An incorrect guess loses all gains on the Cash Ladder, but the player can collect winnings on the Cash Ladder anytime before a loss. The Cash Ladder also has its own range of bonus games. Instead of collecting the prize amount at each position, the player may instead choose to play the bonus game. There are 7 games to play, and they all offer their own potential bonus prizes. Play the game to try them out!